The new Moto X (2nd gen) became available last night through Verizon, an hour or so before the clock flipped the day to September 26. We pointed it out, but also noted that Moto Maker was not available just yet. If you were hoping to customize a new Moto X or make one with a leather back, you had some more waiting to do. That wait is now over. If you cruise through Motorola’s store, choose the Moto X (2nd gen), customize it, and then click the “Buy” button, you will see Verizon listed as a carrier option. Your choices for Moto Maker are no different than those that are available for AT&T. You still get the 4 new Leather backs, 4 Natural options, and the other 17 or so plastic colors. You can up the storage to 32GB, add branding to the back, customize a boot-up phrase, and more. Have fun! 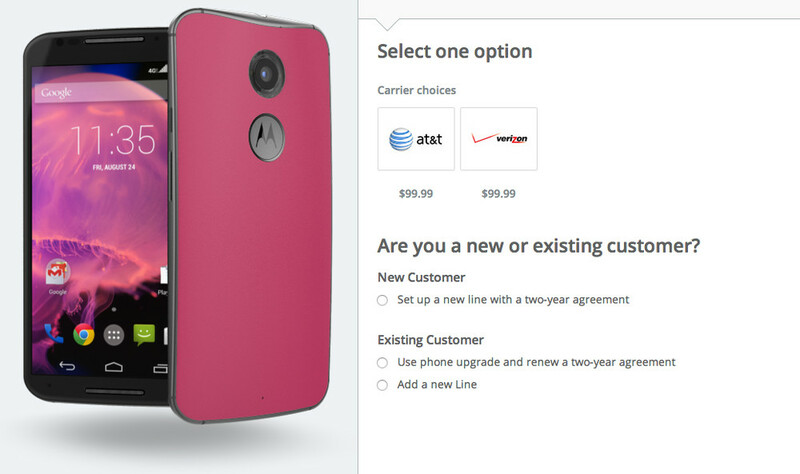 *Note – Motorola’s site says that phones made with white fronts are on back-order and will ship within four weeks.